See for yourself, the MAP difference. Patients fly to us for the results we proudly demonstrate with close-up clinical photography. We encourage all patients and physicians to request this type of documentation by their anaplastologist, ocularist, prosthodontist or whoever they choose to deliver their prosthetic restoration and follow-up care. Please contact us today and tell us about your needs. We would like to help. Advanced degrees, certifications and licensure are important credentials that give some assurance you will receive safe and ethical care from a provider who has demonstrated basic competence in the making and fitting of facial prostheses. However, judging effectiveness is highly subjective. Patients must determine that a provider specializes and that can only be substantiated by seeing many quality photographs of before and after case results of patients with the same condition. Our certified clinical anaplastologists have sought to distinguish facial anaplastology not as an ancillary service, but as a flagship service; a service honed through daily practice in dedicated facilities for over 3 decades. This accomplishment is unique in the United States. Is the provider certified and/or licensed in a field of prosthetics? Is the provider formally trained and/or degreed in fine art (painting, sculpture, color theory, etc)? Does the provider hold a degree in a clinical/health science? Does the provider share evidence of current attachment/design options and final aesthetic results? Does the provider perform the procedure on a regular basis to demonstrate expertise/specialization? Has the provider received favorable or unfavorable professional recognition? Learn more about our location’s accreditations and primary focus on facial prosthetics. The prosthesis on the left was not created by Medical Art Prosthetics. It appears at this stage of deterioration to be almost monochromatic (lacking in color variation) which results in a “plastic” look. The patient received our newly designed prosthesis on the right which featured the skin-like surface details such as superficial blood vessels, moles and hyperpigmentation. 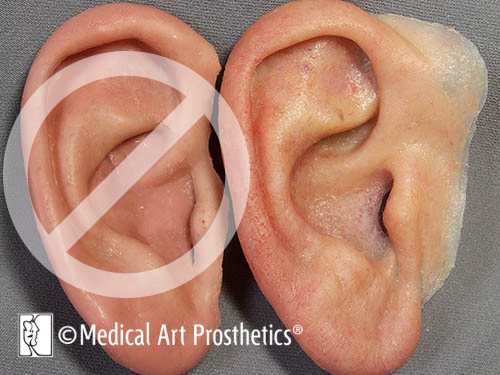 Deeper layering of yellow tones also creates the illusion of antihelix cartilage beneath the skin and a matted ear lobe connotes fleshy tissues that make the final ear prosthesis more natural – more real. 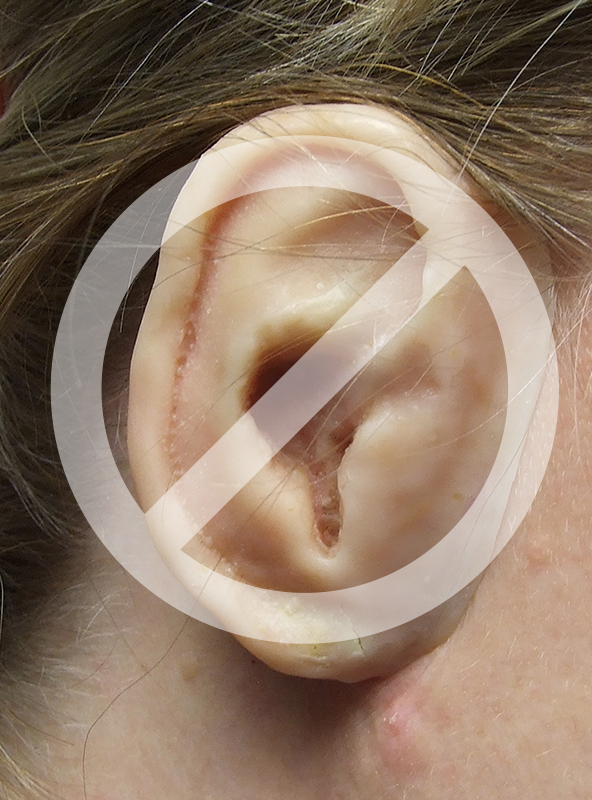 Ear prostheses should not be monochromatic. Rather, they should possess pink, amber, scarlet, and umber at different depths, even lavender in discrete zones – all rendered carefully to make your prosthesis look alive. • Anatomical structure is lacking in detail and refinement. • Coloration is very superficial and opaque. • Reworked surface looks hurried and crude. 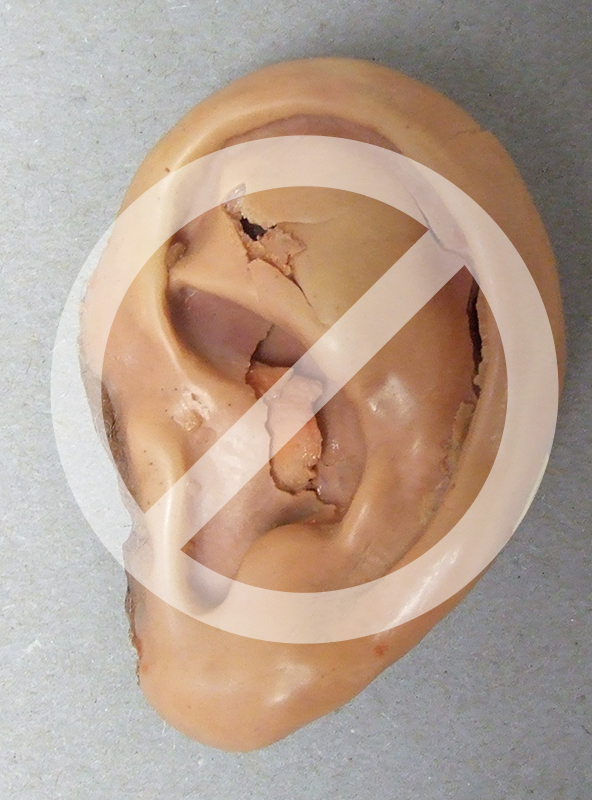 The deteriorated bar/clip-retained ear prosthesis was not created by Medical Art Prosthetics. This prosthesis was fracturing throughout the bulk material and separating from the acrylic substructure. The patient resorted to using medical adhesives to hold the prosthesis together. The new prosthesis we provided utilized a high performance medical silicone with proper appropriate characterization and a mechanically anchored bar/clip substructure for greater integrity and durability. This patient wore 2 different older prostheses NOT provided by Medical Art Prosthetics. They both were made in a non-standard material and lack correct size and color characterization and opacity. They are too translucent. Our prosthesis addressed these issues. This collage documents a patient’s bar/clip osseointegration-retention system and two prosthesis attempts that she had received elsewhere. 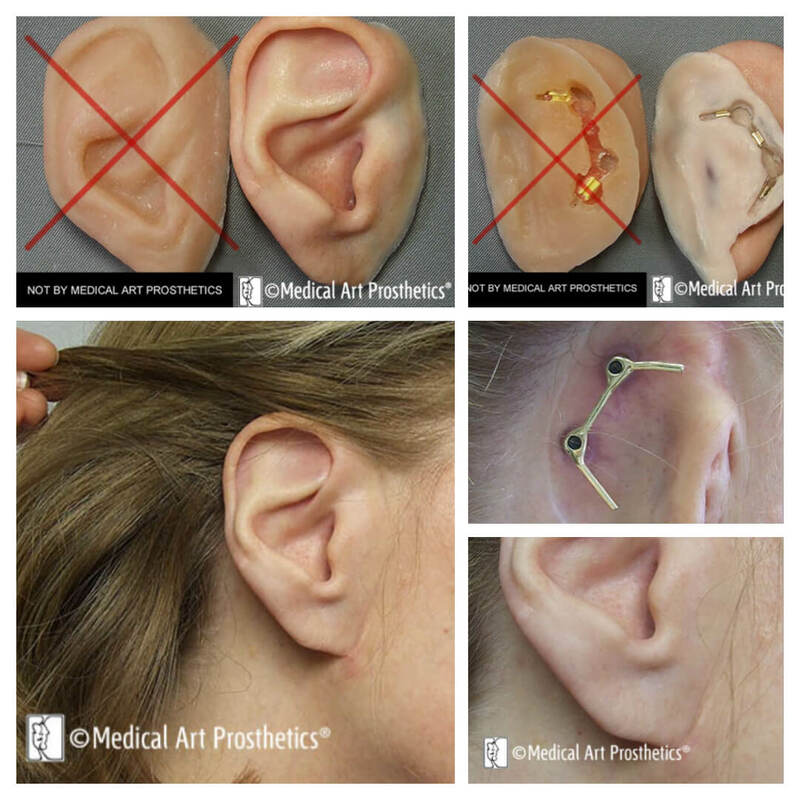 Here we see the new prosthesis that she received from Medical Art Prosthetics and a comparison of the ear prosthesis treatments. 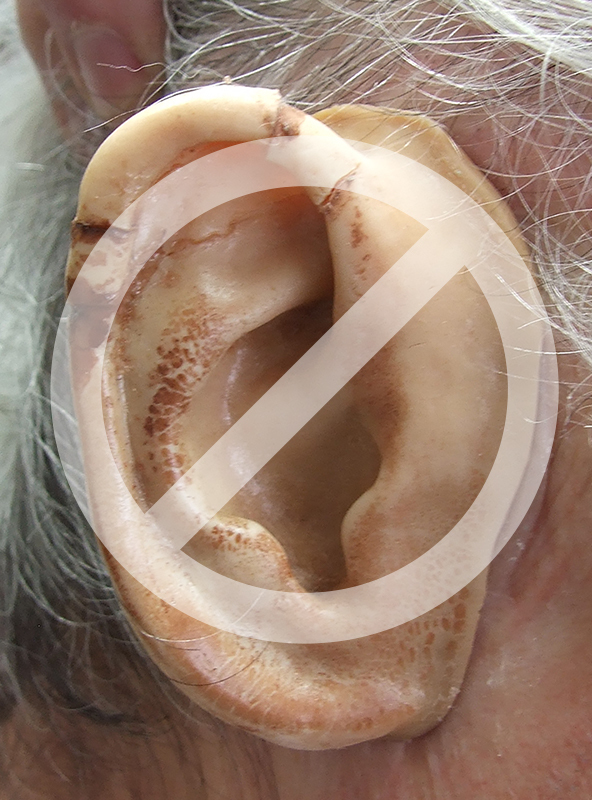 The patient’s older implant-retained ear prosthesis (NOT provided by Medical Art Prosthetics) was fitted with an ordinary samarium cobalt non-sealed magnet which corroded causing skin irritation and attachment failure. 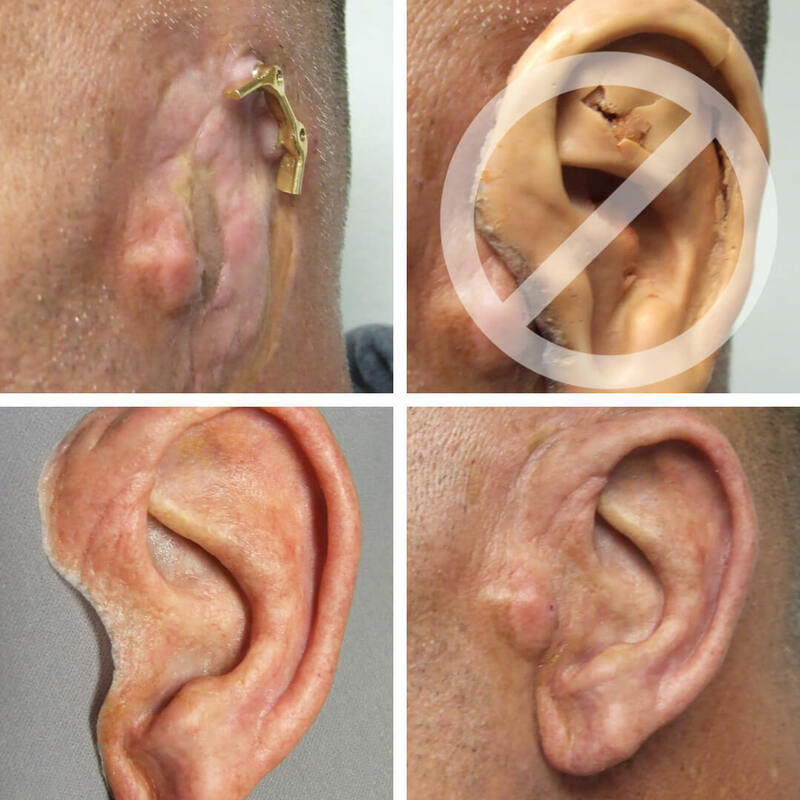 We prepared a new auricular prosthesis with a powerful low-profile neodymium iron boron magnet encased and sealed in corrosion-proof and inert titanium. 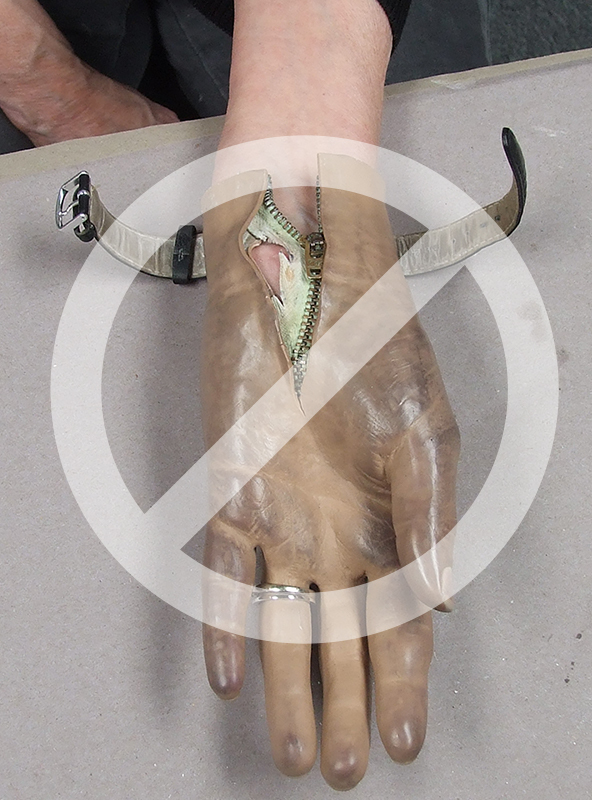 All materials used by Medical Art Prosthetics are biocompatible, safe and designed to last years. 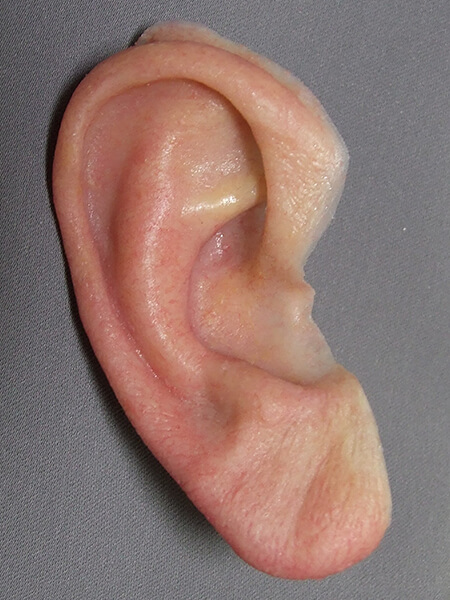 The ear prosthesis created by Medical Art Prosthetics is often photographed next to the unaffected ear to evaluate not only the development of accurate color characterization, but also to verify that the prosthesis will continue to match the unaffected ear color as our client is seen in different lighting situations. 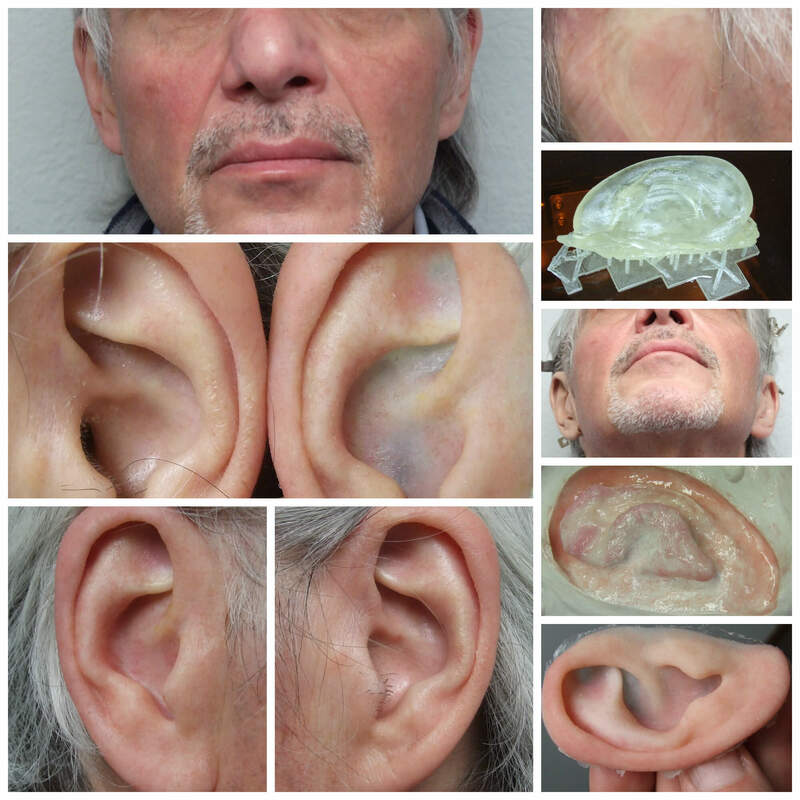 The example below illustrates how the ear prosthesis matches with natural light and a flash.Photographs of the patient’s older ear prosthesis (Red X) are sometimes taken next to our new prosthesis to document the improvements over the deteriorated obsolete prosthesis. 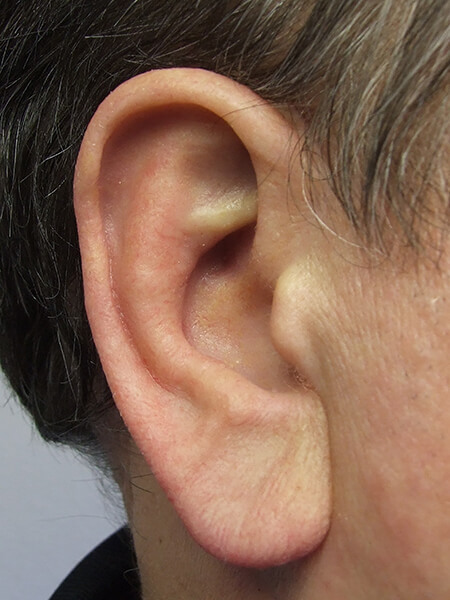 These images serve as documentation and are sometimes helpful for insurance or other 3rd party payers if proof of or justification for the new silicone auricular prosthesis are needed. Many of our clients have come to us over the years with very poorly executed prostheses. While many providers in healthcare want to serve these patients and attempt do so with the best intentions it is unfortunate that the final results are so poor, or at least of much less quality and accuracy than they could be. Some samples are included here just to demonstrate the difference in quality that patients and physicians should be aware of. We are not the only provider of high quality orbital and facial prosthetics. However, our having focused so intently on the special challenges and artistic demands of this area illustrates just how much difference this makes in comparison to the work that result when an individual attempts to provide the service. And it is not only the outward visual effect that suffers from the effort of an unspecialized provider. 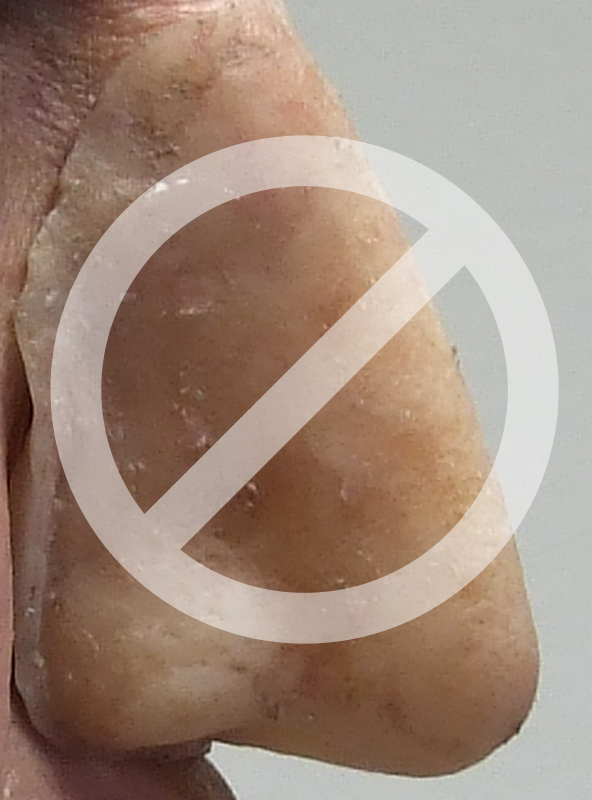 It is all the nuanced care that the patient misses in not receiving the guidance of a seasoned veteran in facial prosthetics in terms of the best adhesives, fitting strategies, silicone variants, cleaning and hygiene management and the experience of knowing how best to prepare that patient with a holistic understanding of the prosthesis and how it relates as part of them and their lifestyle. 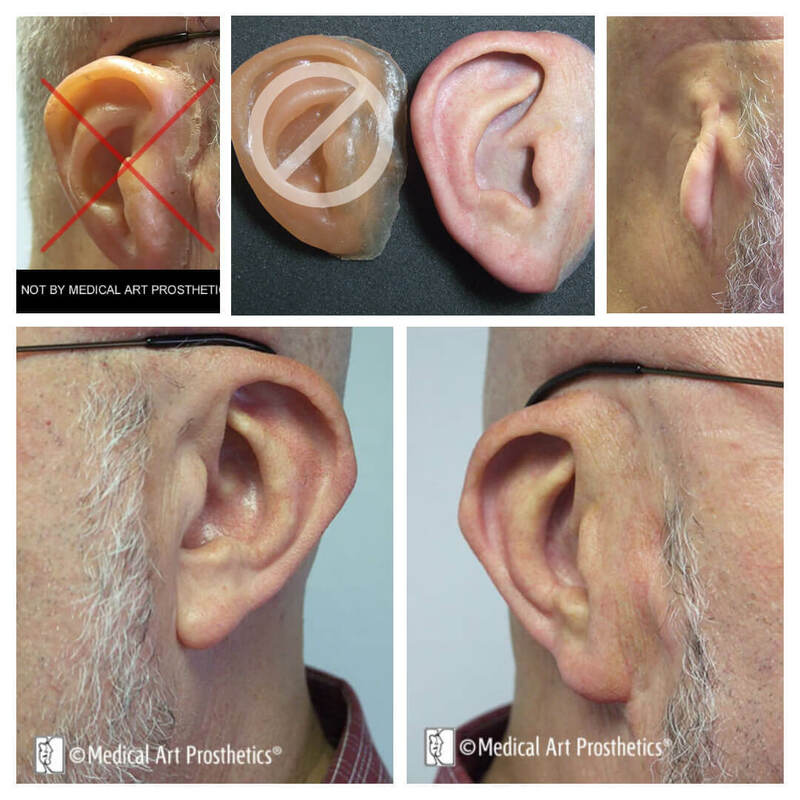 Medical Art Prosthetics designs new auricular (ear) prostheses for individuals from across the country who are ready for a new or a better ear prosthesis. The difference in the level of care and precision that go into the design of your prosthesis may be difficult for you and others to appreciate. For this reason we compare some sample prostheses that were not created by Medical Art Prosthetics with the prostheses that we subsequently provided to replace them. The sample prostheses shown here were created by various practitioners in a variety of settings. They were very likely delivered in a professional manner with great care, and we respect each practitioner’s dedication and effort. However, the improvements we offer in aesthetics and durability can be dramatic and have a dramatic effect on the wearer’s feeling about themselves and their appearance. Therefore, we as professionals feel compelled to educate in any way that helps with informed decision making. In the comparisons we present it should be noted that the previous prostheses are not faulted on the basis of normal deterioration. 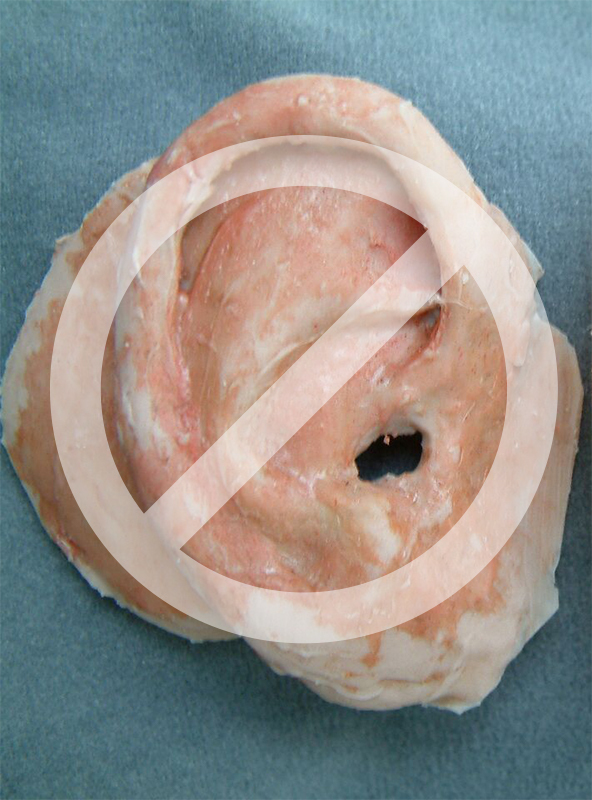 All prostheses are subject to normal discoloration and degradation over time, including ours. 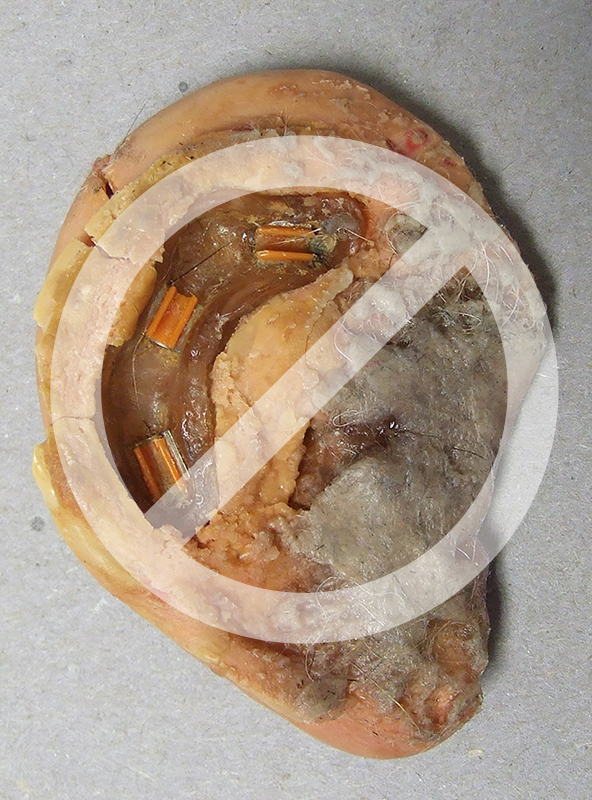 However, aside from normal discoloration and deterioration, these sample prostheses demonstrate fundamental failures or shortcomings involving materials, design, anatomical detail or initial color definition and surface texture. 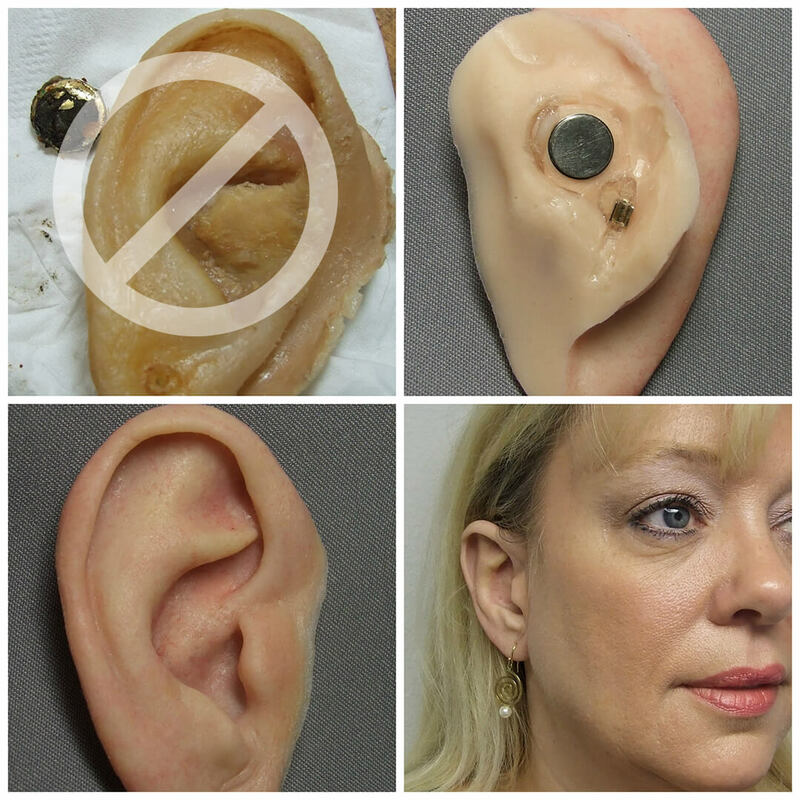 Patients still often wear their current prostheses when they come to our offices, but they always leave feeling that we have improved their experience of wearing an ear prosthesis. 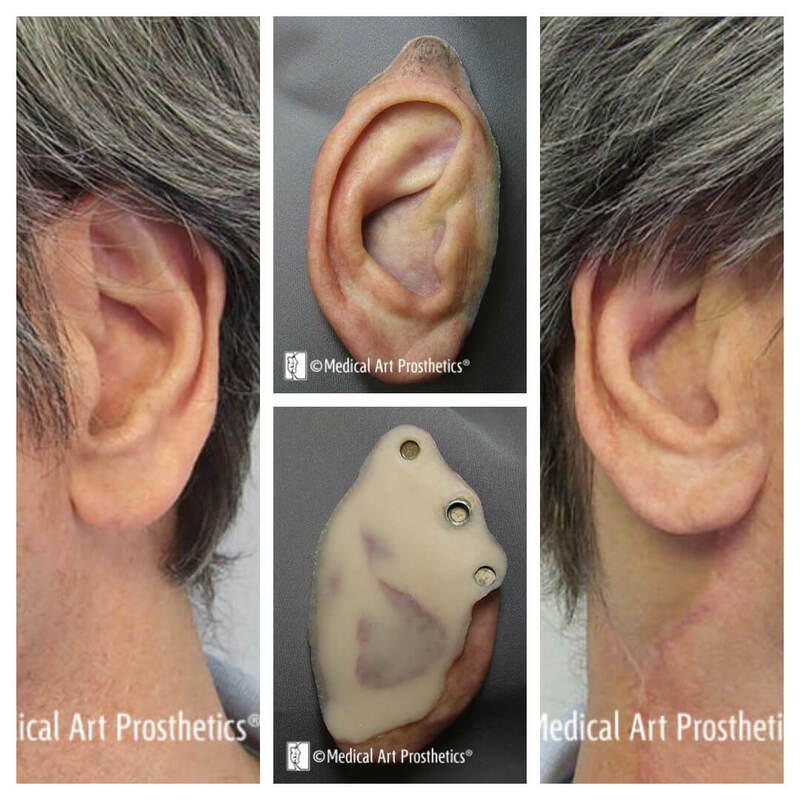 We applaud all efforts of our colleagues in the prosthetics field, but we specialize and in auricular prosthetics that can make a world of difference in a person’s life. During a normal everyday encounter we make eye contact at a normal social distance, about 1 meter. Or in passing a stranger, we share a glance. In either situation we often detect when something does not look quite right, especially when there is a lack of symmetry about the eyes. So when we design orbital prostheses among the many challenges we are faced with the one challenge we have control over is achieving accuracy and naturalism in a set gaze. Here we introduce a simple test to demonstrate the basic quality and effectiveness of our typical outcomes in prosthetic orbital restoration. Our goal is to achieve what we have termed Visual Integration of the orbital prosthesis. 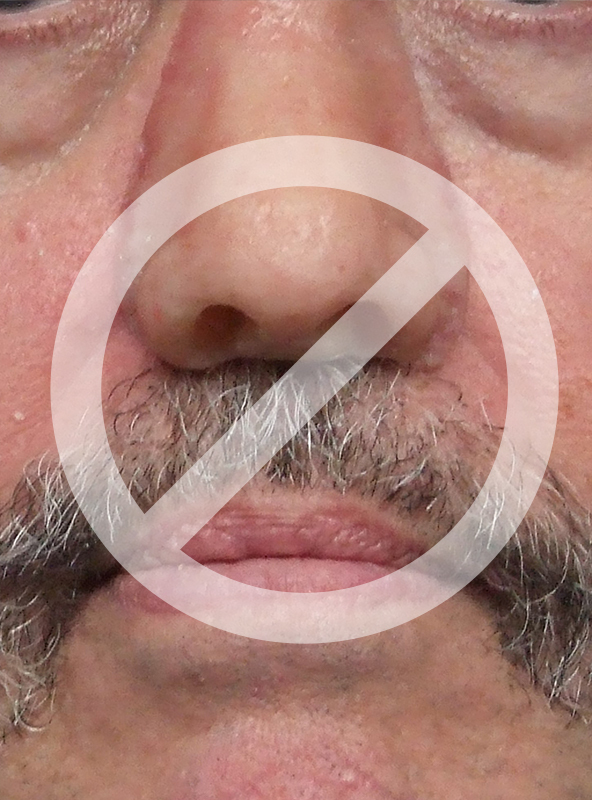 Some wear a larger orbital restoration we sometimes refer to as an upper facial prosthesis or a hemifacial prosthesis. 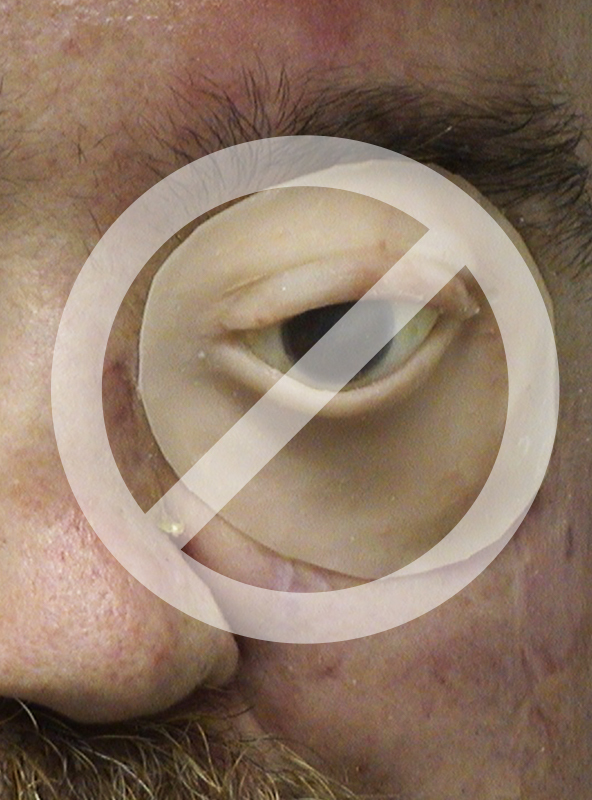 These larger versions all include the prosthetic eye (ocular prosthesis), but they also may include the eyebrow or the nose or the cheek area. Knowing this, is the extent of the prosthetic restoration readily obvious? 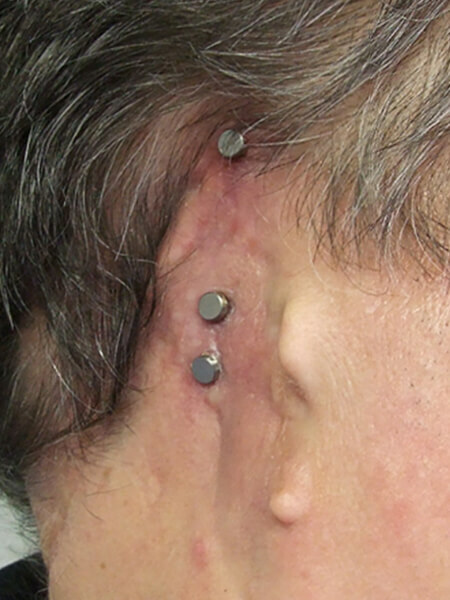 At a glance, would you even detect that the individual wears an orbital prosthesis? If the answer is no, then the wearer can interact confidently knowing they have the most convincing and accurate restoration possible. This accomplishment we call successful visual integration of the prosthesis. All patients are encouraged to select attractive eyewear for protecting the sighted eye and to enhance the overall effect of the restoration. Glasses, even safety glasses as demonstrated by some in these examples very effectively cast shadows and refract light to obscure transitions and soften the fixed gaze of the eye. 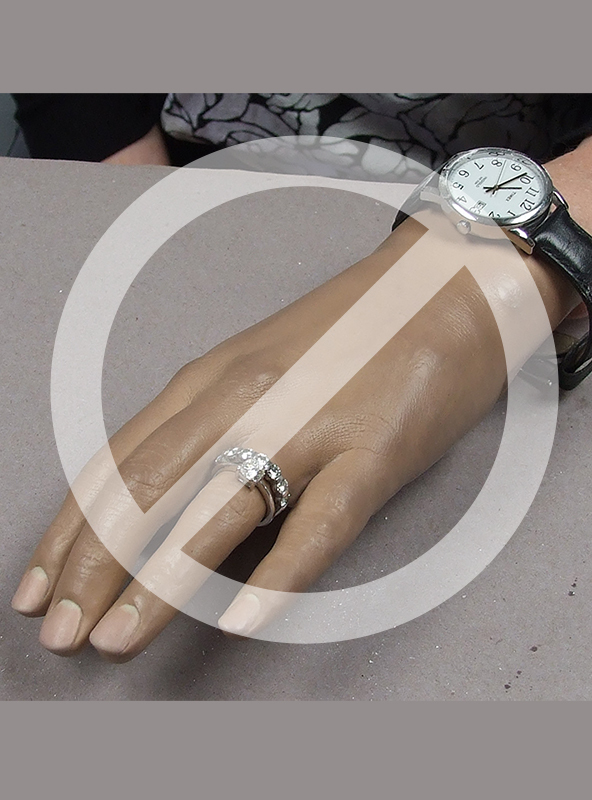 The other main factor in considering what contributes to success in orbital prosthetics is how effectively the prosthesis attaches – not just how secure it is, but how easy it is to position, to remove and to care for without undue concern about damaging the exquisite detail instilled in the prosthesis. An orbital prosthesis that is attractive, durable AND manageable by the patient such that it used each day in the patient’s routine has achieved what Medical Art Prosthetics has termed Functional Integration.